Details: Oil painting on Masonite. Signed Lower Right. Roberts Gallery Label on verso with title, original price and stock number (9064H). Titled and signed by hand on verso: "Victoria Beach at Digby Gut, N.S." and "Annapolis Royal, N.S." Alan Collier artist label and signature on verso. Provenance: Private Collection, Roberts Gallery. Details: Silkscreen by Sampson-Matthews Ltd., 1950, Signed on print. Alan Caswell Collier became interested in art at age 12, and later entered the Ontario College of Art, where he studied under Group of Seven members J.E.H. MacDonald and Franklin Carmichael. After leaving the college, Alan Collier “rode the rails” across Canada and later worked as a miner to raise enough money to study art in New York. By 1939, he had become an advertising artist. Alan Collier returned to Canada in 1941, married and settled in Toronto, working as a sheet metal worker. In 1943, he enlisted in the Canadian army, not returning to Canada until 1946. At that time, Alan Collier resumed his career as an advertising artist but began to do more paintings. During the late 1940s and well into the 1950s, Alan Collier painted scenes of underground mining in northern Ontario. Alan Collier was elected a member of the Ontario Society of Artists in 1952. A few years later, he was named a member of the Royal Canadian Academy and joined the teaching staff at the Ontario College of Art. Each summer, Alan Collier would travel to different parts of Canada by car and trailer with his wife and son to go on sketching trips. Alan Collier’s paintings are known for their rich colour, full of the beauty any tourist may see but only which an accomplished artist could recreate and share. This description is apt for the silkscreen included in the Sampson-Matthews Ltd. catalogue called Emerald Lake, Yoho Park (See blog post on Sampson-Matthews silkscreen project). It is full of vibrant colour, capturing colours a snapshot couldn’t. 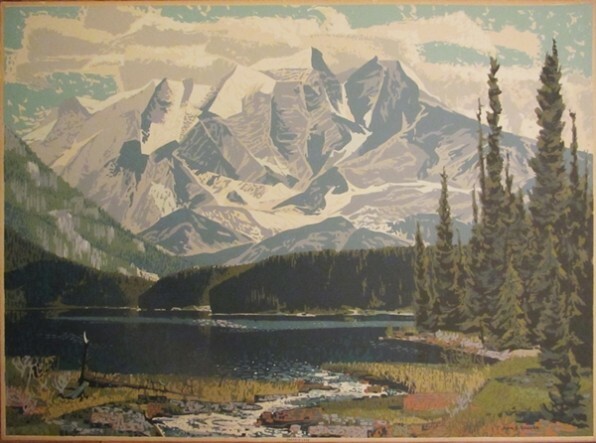 American firm Standard Oil commissioned Alan Collier to paint eight paintings depicting landscapes along the Trans-Canada Highway. The artist left teaching in 1963 to devote his full attention to his paintings. In 1971 a retrospective exhibition of his paintings and drawings from 1935 to 1970 was organized by the Robert McLaughlin Gallery in Oshawa, and then shown in a number of Ontario galleries. Alan Collier also sketched in the high Arctic. One work, Across the Tundra, was reproduced as a $2 stamp by Canada Post in 1979. Alan Collier painted many landscapes of Canada, but was also known for his fine portraits, which included his wife, Ruth Brown, and many famous business and entertainment personalities. He also painted many commissions over the years. 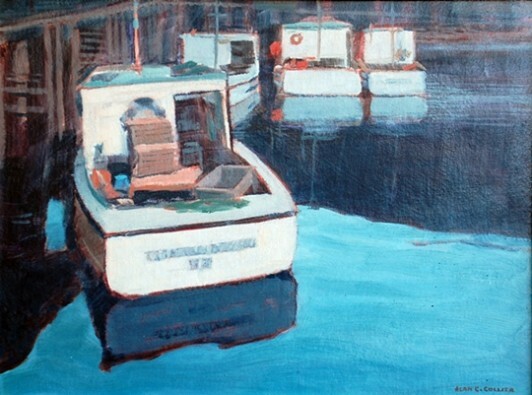 Alan Collier had numerous exhibitions over his career, including some 20 at the Roberts Gallery. His artworks are held in numerous collections, including the Government of Ontario (Mining in Ontario artworks, and portraits), National Gallery of Canada, Art Gallery of Ontario, Art Gallery of Hamilton, Robert McLaughlin Gallery, to name just a few.